I wanted to do a few reviews this evening but the lighting is so bad the pictures where just awful so I thought I would do a chit chat type post and share some of the photos I’ve taken this week. 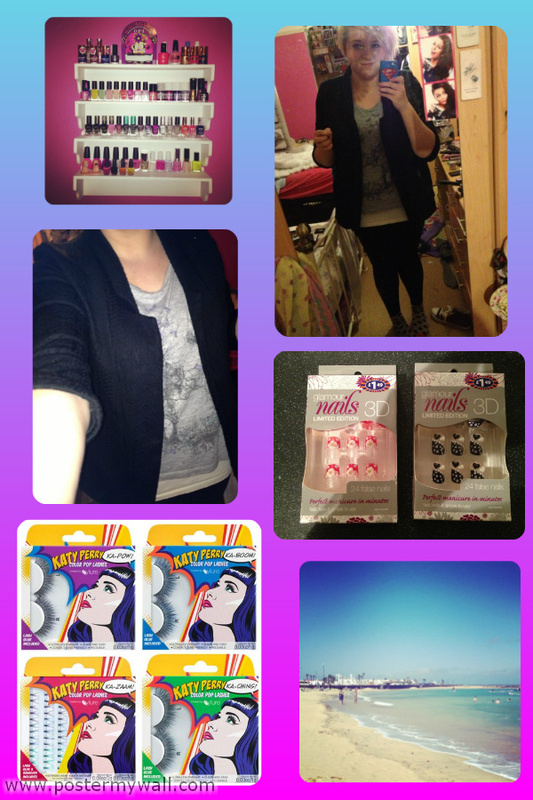 Top to bottom, left to right: My nail varnish display shelf, my outfit today (sorry for the messy background, blaming the sister! ), my new River Island blazer, new 3D false nails I’m going to try out, Katy Perry Colour lashes coming out January, a photo from Lanzarote. There’s a random bunch of images. I am sorry for the really bad image of the OOTD type picture. I took it in my mirror which is incredibly dirty and my room is messy. It needs tidying I suppose I should tidy it up instead of blogging haha, but most of it is my sisters. Enough rambling. I am wearing: River Island blazer, Dorothy Perkins top, H&M white vest, Topshop leggings and on my feet I wore my personalised Converses. I liked the look, I was only going for lunch with my family so it’s all casual with a blazer to smarten it up. I got some new false nails today which are 3D with bows, flowers and pearls on which I’m going to try out in a bit so I’ll post a picture tomorrow and a review after I’ve used them.They where only £1.49 in B&M Bargains. The next photo is from Google images, it’s the new Katy Perry Eyelure lashes. I read that they come out in Superdrug on January 7th and Boots on January 28th, I can’t wait! I’m going to be stocking up on them. The last picture is one I took on the beach in Lanzarote when I went with my boyfriend and his family back in August. I love this photo because the weather is so cold and horrible in England I just want the hot weather back. Hope you’ve all had a lovely weekend, I’ve spent mine with my boyfriend, Harry, and my family chilling and shopping. There will be posts up this week mainly reviews as I feel I don’t post many on my blog and should do more.